Seduced by these nightshade jezebels, I bought about 5 pounds, thinking Greek salad or pico de gallo. Pico de gallo won out, because I also bought limes and jalapeños. My heart was beating: taco night, taco night, taco night. It's been a while since we've had another taco night. 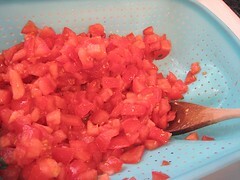 The weather refused to cooperate though and the beautiful tomatoes had to sit in the fridge for about 5 days. Can't very well have a taco night when it looks so grey and gloomy outside. Finally, on Sunday, we got tired of waiting. I had thawed out the corn tortillas we had in the freezer and there's no turning back. There's also a chicken in the fridge that has been patiently waiting its turn to be made into pollo. Since we know what we're doing (hah! ), it was straight to work. We didn't try to dazzle with the quantity of condiments this time. 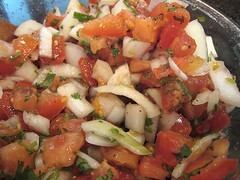 Mandatory: chopped cilantro and minced onions. 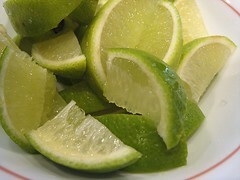 Oh, of course this is mandatory as well: lime wedges! I'm posting a picture because they're so pretty. 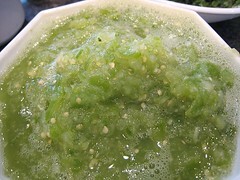 The old standby, salsa verde using tomatillos. 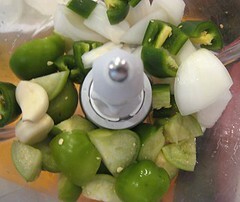 Everything went into the food processor: tomatillos, onions, jalapeños and garlic. I saw somewhere that one's supposed to cook/blanch tomatillos before using them. Is that true? We've never cooked ours... to no ill effect, I think. 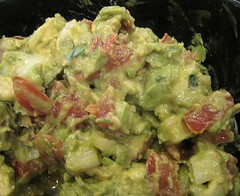 The guacamole is basically the pico de gallo plus avocado. But hey, what's that below? That is new! I don't know what this is called. Maybe "Rajas"? That's as per JS. 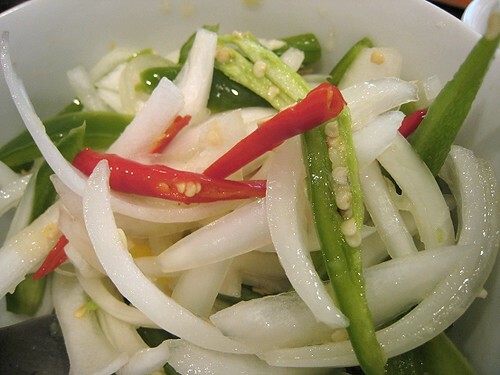 It's sliced onions and chile peppers with lemon juice. I saw this first at Doña Cata. It's my favorite condiment, I think. We also just made 2 kinds of fillings. Well, three, but the 3rd one's the black sheep of the filling family. 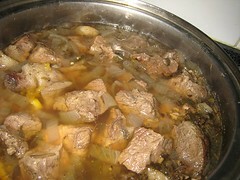 This is again a slightly different recipe than what I had before. See, I forgot how I did the original one when I did the dish the second time, and I forgot what I did when I tried it again for the third time. So, there's just a pileful of forgetting going on. I decided to do an Internet search and this recipe caught my fancy. I decided to use it as my jumping off point. 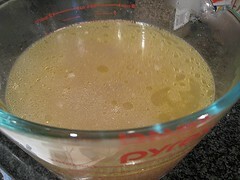 I added some oregano, more garlic, and some epazote to the liquid. 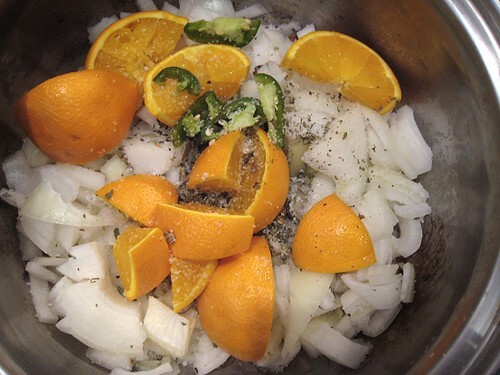 Oh, and oranges. 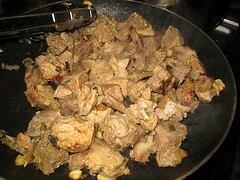 The recipe says that the liquid will reduce and the pork should just fry off in its own fat. 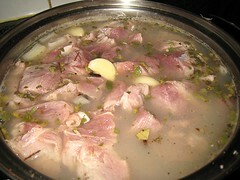 It didn't happen (I had the feeling that it won't) so I had to fish out the pork pieces and sauté them instead. I added garlic while sautéing. I could have roasted them, I suppose, in milk too, like the first time, but we were pressed for time. We started doing the work for the taco night around 4:30 and dinner is in a couple of hours. To top it off, we had guests coming so we had to be ready to serve. No 4-hour beef shin dish here. 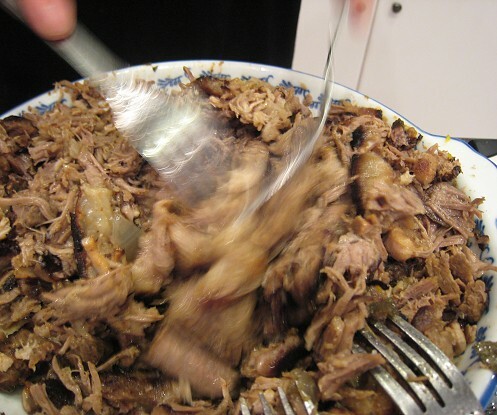 I didn't want to shred the meat and wanted to keep it in small bite-sized pieces but TS insisted that we shred it. Of course you had to shred it! 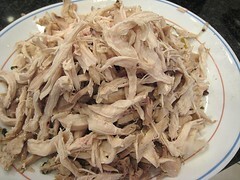 What kind of carnitas would it be unshredded?! 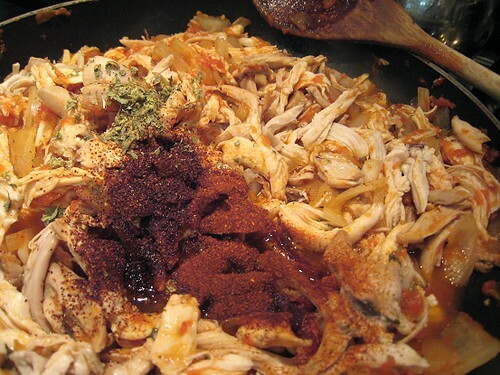 I saw this chicken filling on -- of all things -- Throwdown with Bobby Flay. This woman in Texas was making puffy tacos. They deep-fry the tortilla to make them puffy, hence, the name. 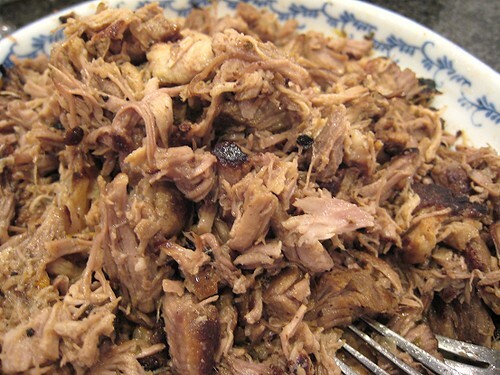 We don't deep-fry (as mentioned), but her filling looks like good home-style cookin'. Hers was poached chicken sauteed with onions, green peppers and tomatoes. I don't know what other seasonings, if any, she had in there. 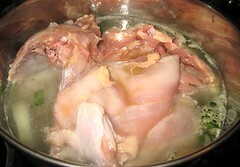 I poached the chicken in some water with onions, Mexican oregano and cilantro. Cilantro makes everything smell so good! When that was done, I shredded the entire chicken! That was sort of a labor of love right there! Shredding the breast is easy! But the ENTIRE chicken!? Then into a pan it went. 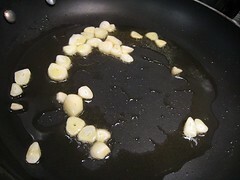 I started sautéing some onions first. 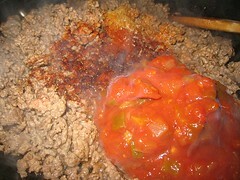 We didn't have any green peppers on hand, but that would've made the mixture smell quite different. Then, the chicken, canned tomatoes (that I've puréed), Mexican oregano and a couple kinds of chile powders. I believe in this case, it was New Mexican, California and Ancho chile powders. This is just what we had on hand. And no! Of course we didn't throw away the poaching liquid! But we'll save that for a different time. Since one person would rather have tex-mex taco beef (I know, I know), we made it. Well, it's not bad. It's good in its own way, but hey, it's not very Mexican now, is it? 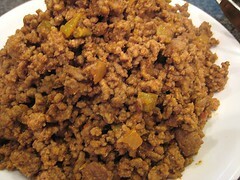 I browned some ground beef, then added chile powder, cumin and, my secret ingredient, Pace salsa. 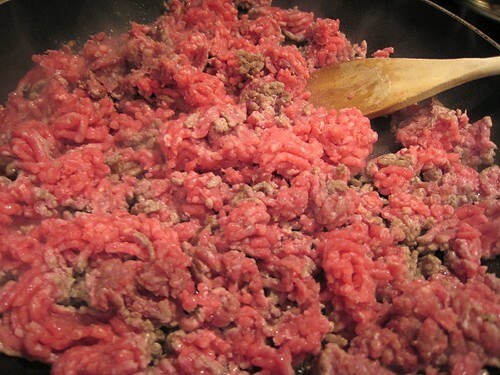 Look at that nice organic beef. Pick a filling, mix and match your condiments, and get taco-happy! I'm sure there were a bunch of other combinations going on this taco night. But those two above are classic. What did Alyn say? Ah yes, they're "very basic, very simple, very down-to-earth." Amen to that. i just read from the top down. holy mackeral, holy guacamole, i mean, that was really quite the month of may. unbelievably delicious food. great posts. Thanks... we would've done a lot more, if it weren't for pesky distractions like... oh, I don't know... work! 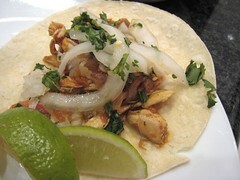 I am very impressed with the authenticity you all are trying to keep while introducing more Canadians to Mexican food. :) I would just like to comment that I live in Central Mexico, and to me, "rajas" are cooked poblano peppers, and they are usually served mixed with cream and corn during lent as a taco. 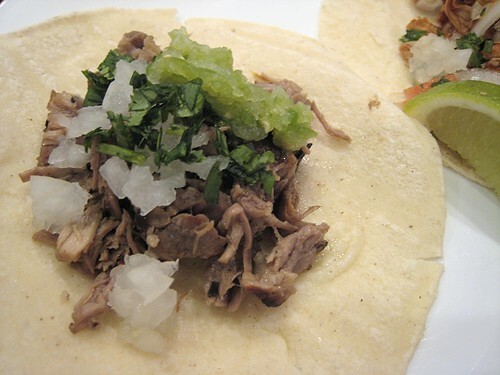 A darn good taco, at that. 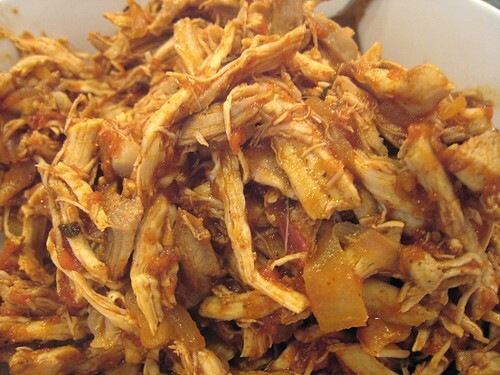 You should try it for your next taco night! Thanks for stopping by! 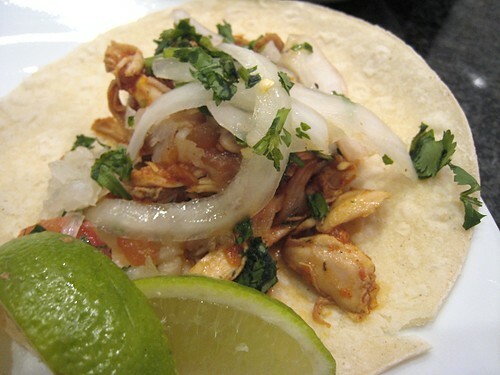 Mexican food is definitely something we would like to cook & eat more of. Thanks for the info! =) As it happens, we have a couple of poblanos in the house!